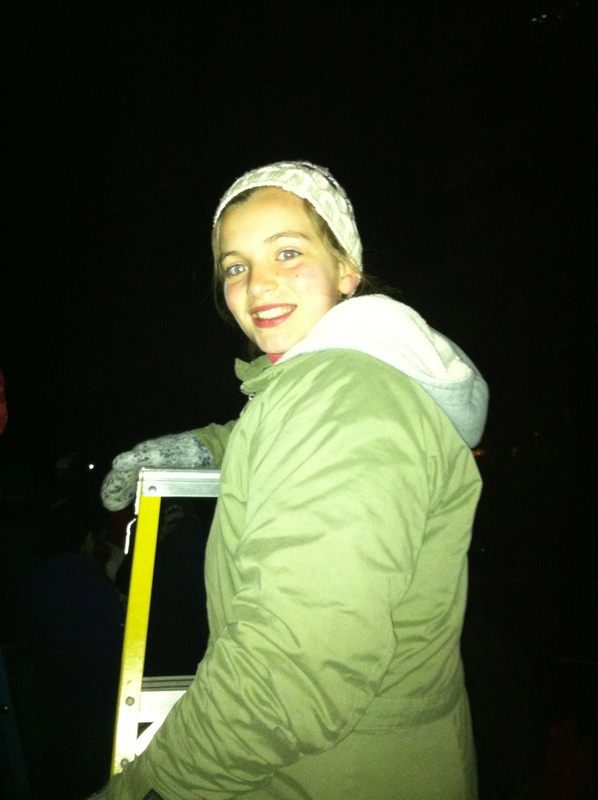 I attended the Reenactment of Patriots Day with Maggie on Monday, April 15th – and although I have lived here for twelve years; this was my first time to wake much before dawn and head downtown with my ladder; a cup of coffee and one of my children. Till now, Gary had always taken the children; the boys when they were much younger. With the promise of extra credit; Maggie was not to be deterred…and frankly I was quite happy to go; living in Lexington all this time, it felt like the thing to do. And so we did. Waking early – heading to the center; early dark black cold morning. I was struck by our mode of transport; trying hard to imagine what it was like hundreds of years ago – and eerily realizing that despite the very early hour; I was not alone on the roads; contrary – many like us were heading into town; rows of headlights making their way at 4:30AM on Patriots Day. I had woken this early two times before on a Patriots Day – readying myself for the Boston Marathon. I ran it first in 1992 – a young grad student wanting to share this so sacred Boston tradition in my newly adopted city. And then fifteen years later, four babies later, a lifetime later – I ran with my newest best friend – a renaissance of my life as I had discovered running and new friendship and needed to remind myself of challenge and goal and strength despite all that had changed for me in fifteen years. The Boston Marathon is special. I know many cities would say the same – and it is all true. But Boston is special. Very hard – physically crazy challenging. But the fans, the people, the traditions – Hopkinton; Wellesley; Heartbreak Hill; Boston College. Coolidge Corner; Fenway Park; Comm Ave. Hereford Street; Bolyston. Finish. I have such vivid memories of my my time running Boston. Mostly positive. A father and daughter handing out orange slices. The women of Wellesley. You can hear them for almost a mile. Heartbreak Hill. Seeing Tommy first, falling into his arms for a hug. He had no idea how much I was hurting and didn’t understand why I was crying. Walking with Gary up the next half mile. Telling him how much I hurt and not knowing if I could finish. Banana. Stomach cramps. Chafing so bad that I was bleeding. And then I was struck by the timing of it all. Why wait until almost 3P? — the champions have been awarded; the major media presence has subsided. It really is only people like me still running. Those running for charity. Those who didn’t qualify. These are the people who decided to run for another purpose. Maybe like me to prove to themselves that they still could; maybe because a child they know is dying from cancer; maybe because they have a parent with Alzheimers. They train and they run and they aren’t fast or pretty – and they all finish around 3 and 4PM. So why target that time? Not that there is ever a good time – but for some reason, this seems especially cruel. For whatever reason, they waited. They waited for Martin Richard’s dad. Again – there would never have been a good time. It would have always been tragic. And then, like you, I have been inspired and reminded of good by reflecting and hearing all the stories of those who stepped in to help; on-duty; off duty; visitors; runners; doctors; nurses; first responders. Only three people died that day because of them. Make no mistake. Lives were saved. Lives that should have been lost. Stories now still to be told by many who should have died on Monday. Babies to be born. Weddings to attend. Lives to live. Hard lives now. Lives forever changed. Some without feet or legs. And so I say this. Let us run together next April. However many of you that will join me. We will run together and raise money for those who were hurt. We will run for prosthetics…and chairs…and maybe lost income for those who can no longer work the way they could before. And in this way – in this way – we will remember Marathon Monday. Our Patriots Day. I often reflect on what it must have taken in one’s heart to be a Minuteman. To leave your house in the pitch black morning – to leave your farm with your family inside; knowing that without you, their survival was in doubt. But believing beyond one’s own self, that the greater purpose was more important. Sort of like running toward a bomb instead of running away. Sort of like ripping down a barrier to get to a victim. Sort of like holding someone’s femoral artery in your hand. Sort of like that kind of bravery.